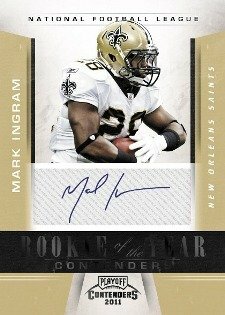 Contenders' Rookie Tickets Autographs are among the most distinct in the hobby. 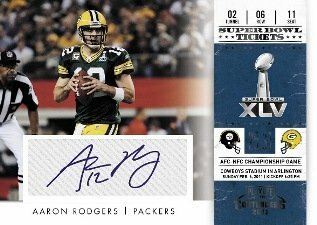 This year, Panini has made the signatures on-card rather than the stickers used in the past. 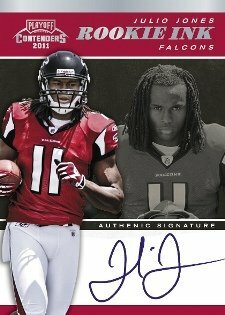 Every box of the mid- to -high-end set has four total autograph cards, including two from the game's first-year players. The Ticket theme carries through other inserts, including Super Bowl Tickets, Front Row Tickets and Black Gold Tickets, which promise solid gold. 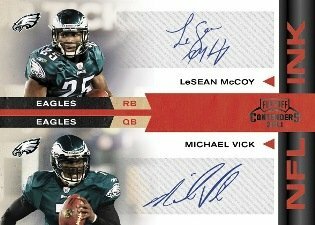 Complete visual guide to 2011 Playoff Contenders Football Rookie Ticket variations. 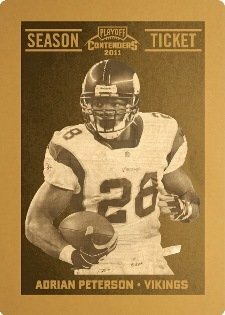 2011 Playoff Contenders Football short prints. 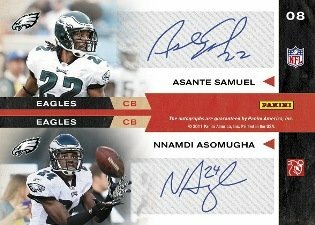 Rookie Ticket Autographs return with on-card signatures. Every box has four autographs, including two signatures from first-year standouts (either Rookie Ticket rookie cards or Rookie Ink inserts). Black Gold Tickets build on last year's Golden Ticket inserts. The one-of-one cards feature real gold. Front Row Tickets is a parallel set with rookie autographs from the 36 participants at the NFL Rookie Premiere. Each card is a one-of-one. The same 36 players also signed Printing Plates for another one-of-one set. Signs of Greatness Autographs looks at the NFL's rising stars. 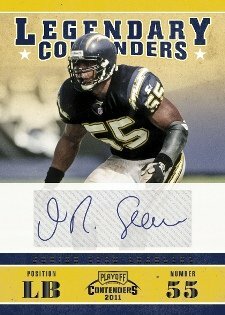 Additional inserts and autograph sets: Super Bowl Tickets, Legendary Contenders, Rookie Roll Call and Rookie of the Year Contenders. I like it… I love it…. I want some more of it. 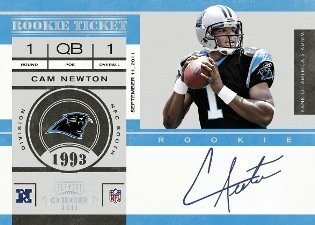 Pulled a Cam Newton auto rc. ‘Nuff said. Does anyone know if the blaster boxes are limited to certain autographs?